Spanish traditions evolve in New Mexico—and tapas are no different. Michele Ostrove explores how to enjoy these dishes anew. for coming up with such a clever, delicious solution to the pesky problem of fruit flies in wineglasses—tapas. According to one theory, these small plates of food with big personalities originated in Spain centuries ago, beginning at the local taberna as a simple slice of bread used as a tapa, or lid, to keep flies out of a wineglass. Then it got better. The bread was embellished with a bit of jamón (ham) or anchovies, and the glass of wine or sherry was complemented by a small bowl of olives or fried almonds—in keeping with the notion that drink should always be accompanied by a bit of food. Gradually, each bar developed its own special tapas based on its region’s gastronomic specialties—mushrooms, potatoes, shellfish, meat, eggs, or cheese. The idea gradually spread from southern Spain throughout the country and, much more recently, the world. Fortunately, this tasty, sociable style of dining thrives today in New Mexico, not only as the specialty of such Spanish restaurants as Santa Fe’s El Farol, El Mesón, and La Boca, but as an option on menus that feature Asian, Middle Eastern, South American, and other cuisines. Such is the case with Cosmo Tapas in Albuquerque, whose owners, Guillermo Loubriel and Cecilia Kido, get their inspiration from a variety of ethnicities: Loubriel is Puerto Rican, with grandparents from Spain and France; Kido is Chilean and Japanese. “We serve tapas from all over the world, including New Mexico,” says Loubriel. 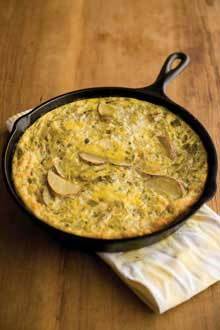 Their popular Tortilla Española, for example, a sort of potato omelet, gets a regional twist with the addition of local green chile. Michele Ostrove is a Santa Fe–based writer, editor, and public-relations specialist. She founded Wine Adventure, the first wine magazine for women; organizes New Mexico Restaurant Week; and is launching Gourmet Passport, an exclusive dining club. 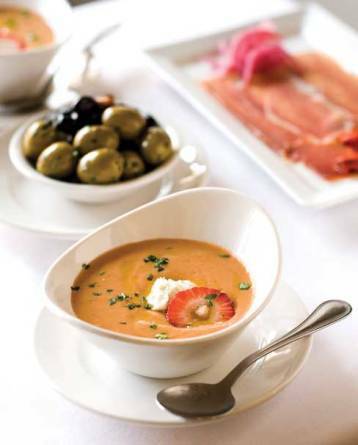 For a fresh, seasonal take on the tapa, try this cold strawberry soup. The recipe comes from La Boca owner-chef James Campbell Caruso, who relies on local growers to supply the most flavorful produce for his Santa Fe restaurant. Cut strawberries, vegetables, and bread into chunks small enough for your food processor. Blend all ingredients in processor, adjusting salt and pepper to taste. Serve chilled with a glass of Fino (a dry, pale Spanish sherry) or Amontillado sherry. Chef David Huertas, of El Mesón in Santa Fe, shares this version of a traditional tapa recipe: Clams with Sausage in the Style of Cádiz. Heat olive oil in large skillet. Add garlic and onions and sauté until translucent. Add chorizo and sauté 2 minutes more. Add flour and paprika, cook briefly, then slowly add sherry, stirring constantly to well integrate flour and sherry. 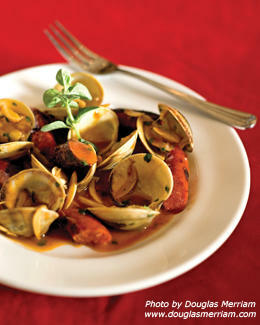 Add clams, cover, and simmer until clams open (discard any unopened clams). Depending on how much liquid remains, you may need to add some whitefish stock or water to get the right consistency. Add salt and parsley and adjust seasoning to your liking. Serve immediately. This potato omelet, one of the most popular dishes at Albuquerque’s Cosmo Tapas, is a New Mexican take on the traditional Spanish tapa. Fry onions, potatoes, and garlic in olive oil on low heat until soft. Drain and combine with eggs, green chile, cheese, salt, and pepper. Cook in a 10–inch non-stick pan on medium heat until golden on one side. Using a large plate or tray, turn the tortilla over and return to the pan again until ready.